Pedion: Journal #15 - Going Urban! 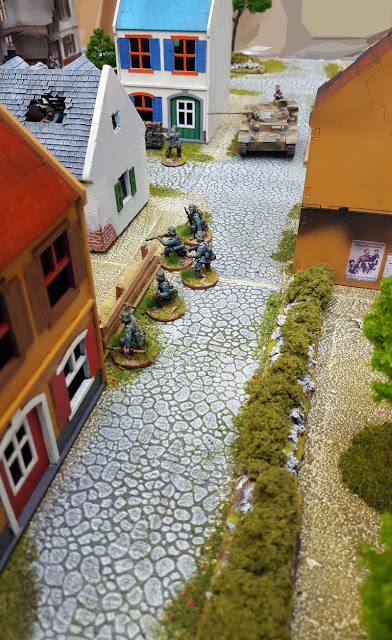 Welcome to our first major 2017 Blog update, presenting the details of our next project, the Pedion Urban Battlefields! For those of you already keeping in touch with this page, this is something you must have been expecting, as it was announced in the previous blog post and all over social media. The Urban Battlefields are to be the first major expansion of our Modular Battlefields line, a comprehensive selection of options to stage village/town/city encounters and battles. It includes enough textures, ideas and designs, to go beyond another "unlock" of our existing line, and qualify for a full campaign on Kickstarter of its own. Ready for some Pedion street fights? What will the new tiles do? look beautiful and authentic, but at the same time be practical for gaming. 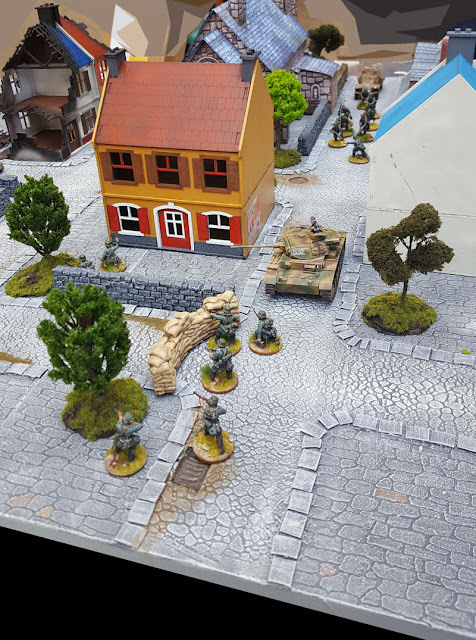 enable the placement of buildings, fences and terrain scenic details in general from any manufacturer, without stealing the spotlight. adhere to all Pedion design parameters: full molecularity, simple connectivity, thin, low weight, durability, easy storage. Have you thought about Buildings, Scale, Textures? Their textures and styles immediately limit the historical/fantastical eras they can be used for (e.g. an asphalt road rules out any non 20th+ century era gaming). Their width restricts their playability in different miniatures scales. This becomes quite more pronounced when there are road lines, which should be in scale. They look a bit drab without any actual urban features upon them, i.e. they look out of place without buildings, since till that time all you see is an unexplained open space crisscrossed with roads. Regarding those last 3 issues, I've gone along and made some basic decisions. Starting from the third one, this expansion will not have anything to do with man made structures. 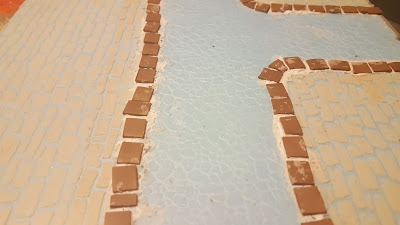 There are many manufacturers of beautiful houses and buildings out there, and I hope they will not mind using their gorgeous products for some photoshoots in order to show off how the tiles would look on your table. Pedion is all about bringing to you stuff that it's not already on the market, and the market has lots of buildings. We have ideas on fully modular constructs, but this will be a specialised, later effort. On the issue of scale, we will continue with our previous selection of 7cm (2.75 inches) for the roads' width. This particular width has been successfully tested on the Modular Battlefields so far, and it "plays" fine, from 15mm to 28mm scales. 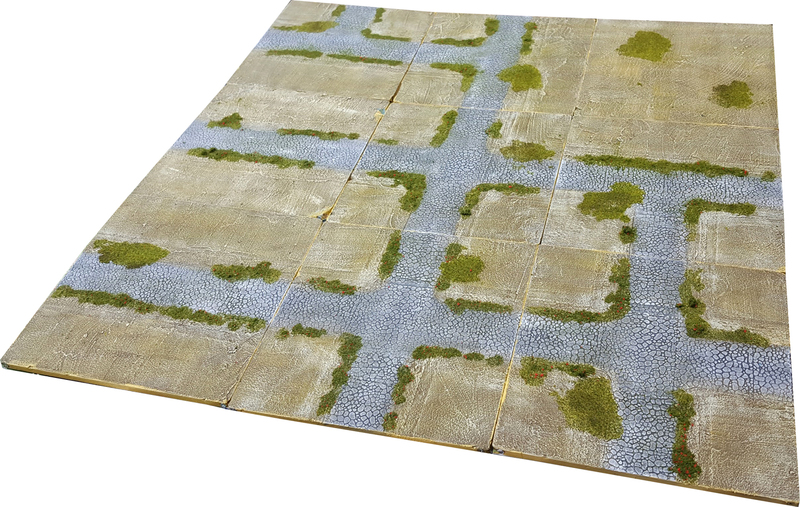 For the mathematically oriented, these 7cm represent a 7 meter wide road in 15mm (2 lane road) or a 4 meter wide road (1 lane) in 28mm. And there is nothing stopping you using a 7cm road as a highway in 10mm urban gaming (e.g. Dropzone). Finally, the new tiles could this way be connected with minimum fuss with roads on our current line. Therefore, we will be going with 7cm width for a universal effect, and perhaps unlock wider roads if there is respective demand during the campaign. Road scale - Does my Tank fit? My only issue are the road lines and markings on modern, asphalt urban environs. Especially dividing lines, which automatically designate road lanes and therefore vehicle size (and thus, gaming scale). This is something we cannot easily avoid, so it will be up to the backer to decide if he/she wants lines to show on the asphalt and what scale to be implied. Designing the road lines will be an added service, to be done in the way each customer wants it. Finally, the selected Themes. Trying to encompass the look and feel of every urban corner in every era and genre can be quite impossible. 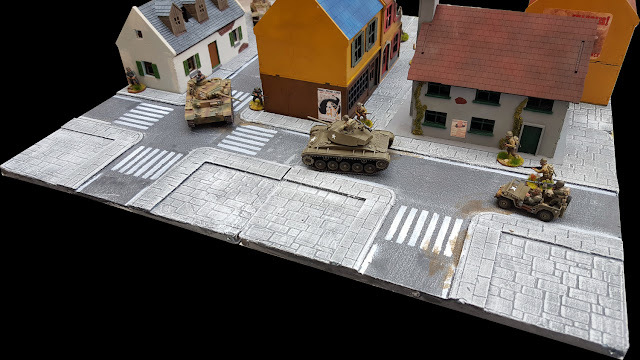 Even more, Pedion is intended for gaming, not for dioramas (however good it may look). So, from all the options, I concluded on three (3) generalised urban terrain Styles, feeling that they could cover multiple periods and that the buildings placed on them would do the job of specialising the board's historical/geographical/genre purpose. 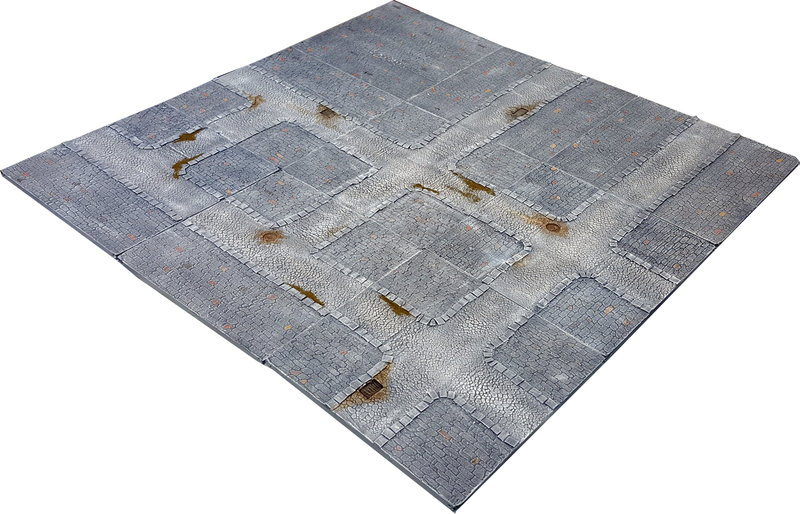 The first Style available will combine classic cobblestone roads with a "dirt"/soil texture on non-paved areas, i.e. the spaces reserved for buildings. The soil texture is broken with patches of green vegetation, and there are extensive grass tufts on the road sides, where the water usually collects. The dirt coloration is a not one used in our tiles before, but completely new, intended to be more neutral for any geographic location. The style works quite well on on Urban/suburban environment where the people may have used cobbles to pave some of their streets. It fits Rustic settlements, rural areas, villages, small Towns, even ancient cities if the residing civilization used stone on roads. By leaving open spaces in-between the houses, one can create smaller alleys and dirt paths branching away from the main cobblestone roads. There are no signs of a drainage system, so that the Style can be used in areas and eras where an underground one would not exist. In the following photos you can see the Style used on a 3'x3' configuration of 9 tiles, with and without buildings and miniatures. Or... how about a fantasy Village, with some Goblin Raiders? Perhaps the more robust Style, as it can be used in many a Wargame or RPG scenario. The style uses two different cobblestone patterns, a smaller, recessed one for the roads, and a larger, embossed one for the building spaces. There is an irregularly shaped string of stones on roadsides to act as a primitive sidewalk, and there are drainage grates implying the existence of basic sewers. The Style can be used to represent the basis of multiple urban environments, especially medieval areas, fantasy settlements, and many European City Centres up to the present day! The following snapshots give an example of the Medieval Style, with and without extra stuff on it. The same board, now with greenery, buildings, fences and entrenched German troops! For those gaming in the modern (or futuristic) era, I've designed a Style where the road surface is asphalt, the open areas are paved with large geometric stones, and there are proper pedestrian sidewalks. There are again drainage facilities, like manhole covers. The sidewalks protrude 1mm from road level and they are 2.5cm (1") wide. As mentioned above, road lines are possible but may limit the option of playing in different scales. Greater road width will probably be an option during the Kickstarter. 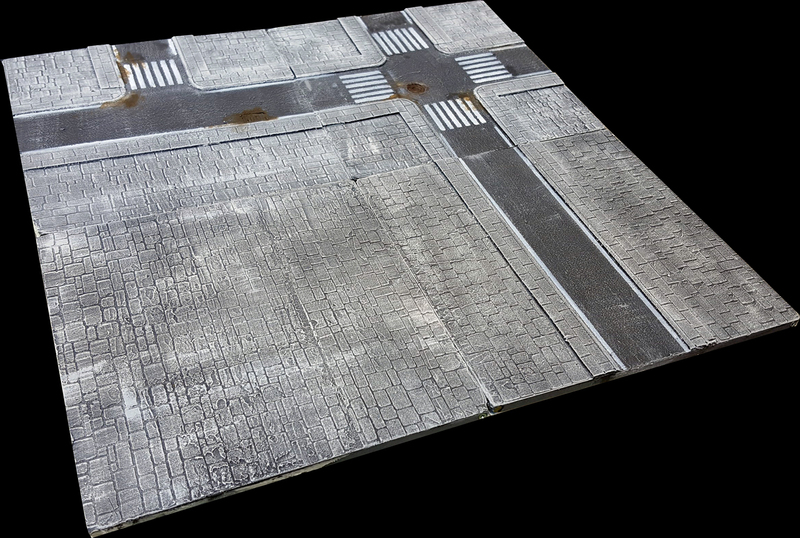 The main reason for a running a KS campaign for this expansion is actually the same as for our previous one: we want to gauge if people like the idea behind those tiles, so that we can iron out all the details and schedule up a full production. By running a KS campaign we will be able to find out toward what designs do gamers lean, and flesh out specific ideas and new designs with our supporters. This will not be a simple "preorder" phase, but a chance to bring people to our drawing board, months before we start actual production. What about the Kickstarter which is still fulfilled? 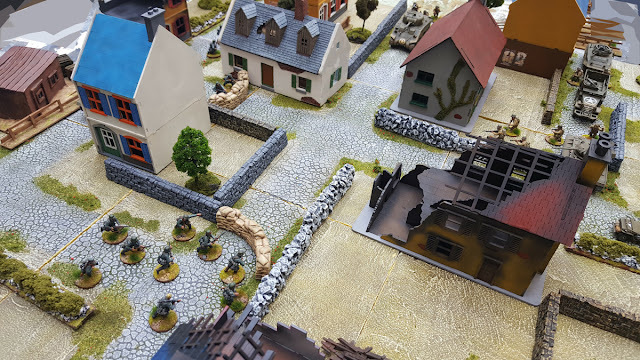 The newer campaign will by no means affect or influence the current production and fulfillment of the much more complex previous Modular Battlefields campaign. The new KS will pertain to a production which will start months later, with a different design, and under its own production team and personnel. Even more, the Urban tiles will be designed to be more straightforward production-wise, to act as a separate, streamlined line. When will the KS Campaign start? Quite soon! The plan is to have the campaign ready and be able to launch before the end of this month, February 2017. The sooner we start the sooner we will be able to go full throttle after finishing all current fulfillment. 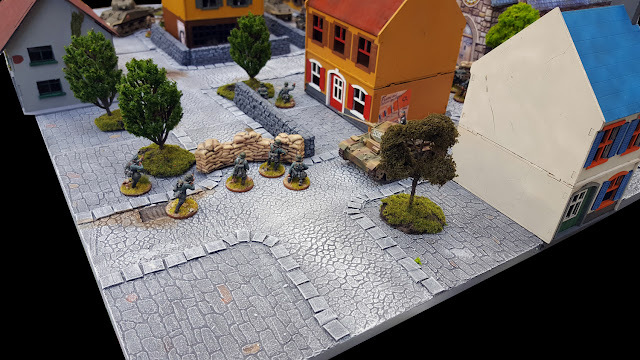 There will be one more Blog post to give more details on the Campaign, as well as to discuss various ideas and expansions on the 3 basic Urban Styles. There you will find out more on add-ons, unlocks, stretch goals and how the Urban tiles will work with the current .Pedion Sets. But you can keep in touch and learn about any news if you follow us on our facebook page and/or our twitter account! Hope you enjoyed reading all about our new stuff! Get ready for the Kickstarter!